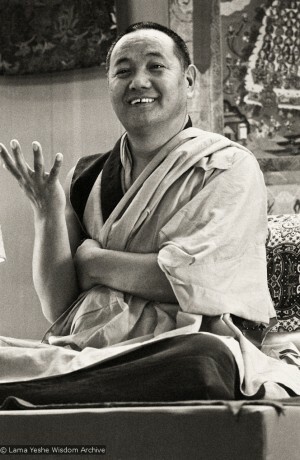 Lama Yeshe teaching, Yucca Valley, United States, 1977. Photo courtesy of Lama Yeshe Wisdom Archive. Why do we need a guru? Because in order to cure our diseased minds, we need the help of someone who knows how to do it. Since it is extremely difficult to understand how the mind works, we need the guidance of an expert in this area. Furthermore, gaining liberation, or inner freedom, is not an easy thing. Everything we have ever said or done on this trip we call life has had its origin in the mind, and similarly, the entire path to liberation and enlightenment depends on the mind. However, if we think of all our life’s experiences, how convinced are we that they have all come from the mind? In order to really understand how this is true, we need someone with the right kind of knowledge to explain it to us. In other words, we need a guru. We can say that there are two types of guru, relative and absolute. The absolute guru is the all-knowing wisdom that is one with bliss; that wisdom is the absolute guru. In order to realize this wisdom within ourselves, we need a relative guru to show us how. Therefore, “guru” doesn’t necessarily mean something physical, but beginners, who don’t possess much inner knowledge, definitely need a physical guru. After some time, when we have enough confidence and self-knowledge to travel the path to enlightenment alone, we don’t need to always be in the presence of our relative guru, but until that time, we’re like yo-yos. When we’re around our guru, our mind is subdued, but as soon as we’re a mile or two away, our mind goes completely berserk. That shows how we are. Putting it another way, the guru is the antidote to the confused mind, as long as he’s the right guru. A guru who’s a bad influence and leads us to more confusion and restlessness is a false guru; not a guru at all. From a talk by Lama Yeshe at Istituto Lama Tzong Khapa, Pomaia, Italy, September 1977.